Combatants for Peace was founded in 2005 by former Israeli soldiers and former Palestinian militants who decided to collectively put down their weapons and nonviolently fight for peace after connecting to the personal stories that they all shared with one another. Now it is led by at least 14 leaders from the Palestinian perspective and 17 leaders from the Jewish Israeli perspective, coming together to create a third space where they can find a new means for peace. Combatants for Peace believes that only through partnering together through nonviolent means will the bloodshed, settlement project, and overall occupation end. They seek to educate toward reconciliation and nonviolent struggle in both Palestinian and Israeli societies, and to pressure both authorities to terminate violence, end the occupation, and begin a constructive dialogue. Below are two examples of some of the leaders, which can all be found on the group’s website here: Combatants for Peace. Oren Kalisman was in the Israeli army as a lieutenant and then as a platoon commander, and he grew up becoming used to ignoring the Arabs’ presence in Israel. However, he slowly began to turn against the Israeli side, and the tipping point was when one Palestinian shot and killed one Israeli Jew, and in return the army killed 15 Palestinian police officers in revenge. After this event, he participated in “Breaking the Silence”. Suliman al-Khatib is a Palestinian Arab who, at a very early age, joined the “Fatah” movement against the Israeli Occupation. After an occurrence where he stabbed Israeli soldiers, he was sent to jail for 10 years, and there he joined multiple groups, participated in discussion, read, and realized that there were many more narratives than he was first taught. He believes there is no military solution, only a joint, nonviolent struggle for peace, freedom, security, and human rights for all. A picture of Combatants for Peace at a protest staged by one of its regional bi-national groups. Combatants for peace is based off of regional bi-national groups, each headed by one Israeli and one Palestinian coordinator. One of the projects that they work on is doing an area tour of Bethlehem to see the separation wall, as seen above, to hear tales from local villagers, show participants the reality of the Occupation, and to see Combatants for Peace activists at work. These tours occur monthly, and afterwards is a talk between all participants from all sides and nationalities. This is one of the most direct creations of a third space here, an opportunity to inform and cross boundaries that might not have been breached before. The film shows the steps that both sides are taking to not buy into one narrative. For the Israeli soldiers, this is a more difficult step as they are fighting a meta-Zionist narrative and the ideas of security that are supposedly justifying all of their actions that they have always been taught. Stepping away from viewing the Palestinians as the “other,” the ones who are barbaric and are threatening their existence, to seeing them as their neighbors who they have expelled and put under an Occupational regime. Jessica Benjamin, “Beyond Doer and Done To: An Intersubjective View of Thirdness,” Psychoanalytic Quarterly, 73:5; 5-46, 2004. Ali Abu Nima, “United, Democratic State in Palestine-Israel,” One Country: Metropolitan Books (New York), 101-133, 2006. Edward Said, “Orientalism,” Vintage Books, 1979. While researching various “peaceful coexistence” efforts in Palestine-Israel, I found many that put the “cart before the horse.” Such groups rely on the premise that peace can be achieved if only each side gets to know each other. Despite good intentions, this is quite naiive. When each child leaves the safety of summer camp, differences in ethnicity and citizenship ultimately prevent democratic coexistence. In other words: the challenge is structural, not mental. This week’s reading, “A United, Democratic State in Palestine-Israel,” (and Azoulay and Ophir’s One State Condition) speaks to this challenge. Informed by historical examples, all one-state solutions mentioned are built on the same premises: reconciliation entails mutual recognition and separation would “require each side to give up more than it is able”. Specifically, the Right of Return, Law of Return, and settlements must all be deemed legitimate. Today, however, Israeli’s far right government seeks to ignore mutual recognition and deny human rights. Permanent occupation, Arab Israeli disenfranchisement, and internationally-condemned settlements continue to perpetuate one-state with Jewish control. Thus, coexistence means political action and regime change. But with slow success within the political system, some Israelis choose the route of direct action and civil disobedience to establish their own facts on the ground. Ta’ayush in Arabic means “Living Together” or “Coexistence.” It is also the name of an Israeli-Palestinian solidarity/activist group. Formed in 2000, the group’s mission is to “end the Israeli occupation and to achieve full civil equality through daily non-violent direct-action” (Ta’ayush Website). Non-violent is the operative word and their resistance rejects both violent Israeli occupation and violent Palestinian actions. Ta’ayush does most of its work in area C of the Occupied territories, most notably in the South Hebron Hills. There they strive to support Palestinian farmers “in their struggle to retain their homes and agricultural lands” (Website). The Bedouins specifically, whose shepherding lifestyle is under threat, benefit enormously from Ta’ayush activism. Specific actions include aiding in farm work, physically protecting farmers, repairing water cisterns, repaving roads, organizing convoys of food and medical supplies, reoccupying “illegal” Palestinian villages, and aiding in legal issues. The Ta’ayush website also features well-written blogs from activists as part of Ta’ayush’s mission to shed light on the occupation. The blogs also offer a glimpse into the meaningful friendships developed through solidarity. With Azoulay and Ophir’s “planes of power” in mind, the privilege of Jewish Israeli citizenship allows Ta’ayush activists to be civilly disobedient. They can confront threatening soldiers and settlers with fewer repercussions. And often just their presence prevents intrusive actions by settlers. That said, it is dangerous work and activists are often arrested, slandered, and physically hurt by tear gas, rubber bullets, or rocks. But it is Ta’ayush’s determination in the face of adversity that should give us hope. Obviously, there is much geopolitical uncertainty in the era of Trumps and a democratic state with Israeli-Palestinian coexistence seems far away. Thus, in the meantime, it is especially imperative for those with privilege to resist the occupation in all ways possible, whether through boycotts, political actions, or direct actions. Abunimah, Ali. One Country: A Bold Proposal to End the Israeli-Palestinian Impasse. New York: Metropolitan, 2006. Print. Azoulay, Ariella, and Adi Ophir. The One-state Condition: Occupation and Democracy in Israel/Palestine. Stanford, CA: Stanford UP, 2013. Print. Guybo111. “David Shulman – Israel Prize Winner Donates Cash Award for Ta’ayush.” YouTube. YouTube, 12 May 2016. Web. 19 Apr. 2017. Taayush. N.p., n.d. Web. 19 Apr. 2017. 2017 marks a historic year, it has been 100 years since the British occupation of Palestine and the start of the issues being faced today in the region. As a testament to the struggle, the well-known anonymous graffiti artist Banksy has opened The Walled Off Hotel, filled with his artwork, in the West Bank only steps from the separation wall. The Gallery is filled with independent artwork, all represent the conflict but come from various artists. Everyone may visit whether they are staying at the hotel or not. The hotel tags itself as the hotel with “the worst view in the world” and hopes to draw the attention of locals and tourists alike in order to create a common ground on which to view the conflict from both sides and to spread the knowledge of this ordeal to hopefully broaden international discussion into resolving it. The artist himself has said that he will not be receiving any revenue from this hotel but instead the money gathered will first go towards breaking even the costs of creating it and then will go to local projects. Not only is the hotel open to everyone but it is run as an “independent local business” and therefore acts as a common ground for all to visit and participate in. Through this project Banksy hopes to “tell the story from every side and give visitors the opportunity to discover it for themselves”. The hotel effectively creates a third space in order to disseminate knowledge and allow visitors to leave and contemplate what they have learned, spreading this knowledge and hopefully raising awareness. To international NGOs and development agencies, peace is often sought through economic cooperation. Olive Oil Without Borders is a program implemented by the Near East Foundation and funded by the U.S. Agency for International Development that does just that. The goal of the program is to bring together Israeli and Palestinian farmers by training them in effective olive oil production and having them work together in the industry. As shown in the video below, part of the goal is to foster peace in the region and have Israelis and Palestinians gain a greater understanding of one another. The Palestinian man in the video says he dreams of an “olive peace”. It is fitting that the olive tree/olive branch is a symbol of peace, and that this program is using just that as its symbol. However, the history of olive trees in the region is not a peaceful one, and the symbol of an olive tree carries much more weight. Multiple times, Israel has uprooted olive trees in Palestine in order to build settlements, pave roads, or further their colonial project in various ways. The symbol in fact embodies a different meaning than peace for many Palestinians. There is a sort of twisted irony that what is supposed to be a symbol of peace is in fact seen as the opposite due to a colonial occupation that is not addressed in the program that seeks to build peace from the symbol of the olive tree. However, it is worth entertaining the merit of a program that creates tangible change by integrating Palestinians into the economy and facilitating cooperation between the two sides. The question is, how do we create a third space by tackling root problems, but at the same time bringing together both sides in the journey to move forward? The economic and agricultural cooperation of Israelis and Palestinians through this program can certainly be seen as a valuable third space,especially when tensions are so high that many Israelis and Palestinians have never even worked together. Of course, it is not the lasting and comprehensive solution necessary, and is merely one part of a long process towards justice. Operation Protective Edge occurred in July and August of 2014, and left over 2,000 Palestinians dead, 18,000 homes destroyed and 470,000 Palestinians displaced. Israeli leaders have a history of framing military objective in broad, self-defense terms. Israel’s military action tends to see a location or a ethnicity as an just identification of an enemy. Israel justified the need for this operation because of terrorist rocket fire in early July and the discovery of alleged underground tunnels leading out of Gaza. The reported goal of the mission was to restore security to Israeli citizens and stop Hamas’s militants from using the tunnels to infiltrate Israel. Throughout history, Israeli leaders have used the idea of counter-terrorism to justify mass-killing and demolition that really serves as a demonstration to Arabs to quench any revolt and serve the oppression. Shortly after the Israeli operation, “Protective Edge,” began in Gaza, a social media campaign was launched by Abraham Gutman and Dania Darwish, a Jewish and Arab student at Hunter College. The campaign had people from all over the world sharing pictures of Jews and Arabs together in peace while using the hashtag #JewsAndArabsRefuseToBeEnemies. The pictures became viral and were shared on different forms of social media. Social media became a kind of third space, where both Jews and Arabs could come together in the idea that humanity is universal and that a hateful state conflict can be worked through if the people on both sides resist giving into fear and continue to see each other as, first and foremost, people. They stand together to demand an end to the racist excuses for violence. The Facebook group allows for a place where people from all sides of the conflict can come together to share and react to news from their own perspectives in a forum with the sole direction of finding lasting peace. “It is time to take a clear stance on the stereotypes, generalizations and the incitement of hatred! While we may not agree on the political developments of the Arab-Israeli conflict, we must demonstrate that we refuse to be enemies. We stand in solidarity with the Arab and Jewish populations who went to the streets of Israel/Palestine to demonstrate that they refuse to succumb to the hatred sentiments of the minority.We don’t believe that if we will all be friends the core issues will disappear and we don’t have to agree on everything, but we do need to show that we won’t be enemies. If you also refuse to be the enemy of someone you have never met just because of their ethnicity or religion, come join us! Propaganda portraying Israel’s unquestionable right to Palestinian land is key to keeping the Israeli (Jewish) people on the government’s side, allowing the military occupations to continue. Showcasing support for “the people”, the image such as the one to the right stands as a solid example of many other media images that spin the narrative that all actions committed by Israel are to protect people’s rights, and therefore, any violence committed in the name of protection is acceptable. One such example in particular being violence from the soldiers of the Israel Defense Force (IDF) against Palestinians and those living in occupied territories. 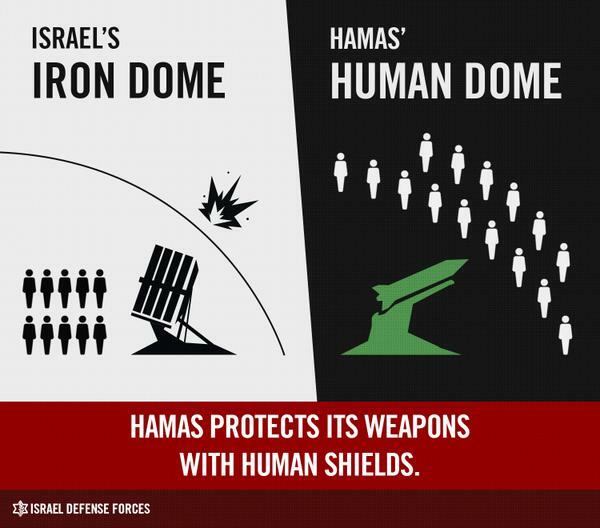 Israel’s “Iron Dome” is a anti-ballistic-missile system meant to deploy interceptor warheads to destroy rockets shot from Gaza into Israel in the air, before they are able to detonate on Israeli soil. Israeli officials have boasted a 90% effectiveness rate, while other experts have said it to be more around 30%. One such tactic most used in pro-IDF media can be boiled down to, “The Palestinians are committing far more atrocious crimes,” which attempts to absolve Israel of any blame, as they claim that Palestinians are obviously far worse in practice. Keeping nothing less than a glimmering light on the IDF forces, which all Israeli citizens must serve in, has built and maintained the mindset that such service and duty is honorable, without question as to the cost. With such rampant vilifying of the Palestinian people, and an unwavering determination to prolong an achieved ignorance amongst Israeli citizens, bringing them out into a “third space” will be nothing less than a painful process. “Tiyul-Rihla (“Trip” in Hebrew and Arabic) is a bi-national organization which develops educational opportunities focusing on Palestinian and Israeli historical narratives, cultures, and identities. Our multi-day trips bring mixed groups of Palestinians and Israelis on tours which provide a unique opportunity for participants to learn about each other from each other by exploring the land and the history they share.” Tiyul-Rihla is a group dedicated to overcoming the educational issues between Palestinians and Israelis. As we have seen for a while throughout the course of this class, the Israeli narrative of the story of their country has been the dominant narrative. With the truth being far different from the stories in the history books, a educational organization dedicated to bringing about knowledge and understanding between the two peoples is absolutely vital. In one of the attached articles from the page entitled “Travelling without political baggage” an Israeli making a trip into the West Bank states, “We can’t solve the conflict or bring peace, but we can help pave the way for people to respect the other’s rights – on both sides of the divide. On the most basic level, encounters like this allow us to realise and understand the right for the other to exist. In turn, on a slightly more nuanced level, it allows each side to respect the sovereignty and legitimacy of the other.” Legitimacy being one of the biggest issues that we have talked about during this class, there is an extreme need for both sides to be able to find a way to understand each other’s legitimate right to exist. By organizing trips and tours for people to go on like the one in the aforementioned article, it forces interaction between the two peoples, therefore forcing the legitimacy directly into the open. Through its educational programs, one sees that knowledge is the ultimate form of power when it comes to breaking down the barriers that exist between these two people. In her book Visual Occupations: Violence and Visibility in a Conflict Zone, author Gil Z. Hochberg discusses the “blinding mechanisms” employed to erase the memory of desolate settlements that were once inhabited by Palestinians until they were forced out during the 1948 Arab-Israeli War. Aside from resignification, the process by which Palestinian ruins are transformed into biblical symbols, the other primary method used by Zionists to remove any trace of Palestinian heritage in Israel is tree planting, which conceals Palestinian ruins from public view. The Jewish National Fund is responsible for creating national forests, along with encouraging Jewish settlement in Palestine. According to the JNF website (found here), the organization has planted more than 240 million trees, covering more than 250,000 acres. While the JNF claims that the mass forestation serves to drain swamps, fertilize the desert, and provide jobs to Jewish immigrants, the new trees also cover up the Palestinian ruins and the memories of expulsion associated with them. Most trees in these national forests are pine, a type of tree which was not seen in the Middle East before the 20th century. Jewish settlers chose the pine tree for two reasons. First, as a European species, the pine tree helped to familiarize the land, making it seem more European. Second, pine trees grow quickly, making it easier to cover up ruins of Palestinian villages over a shorter amount of time. Recently, wildfires have spread throughout many national forests, stimulated by dry weather conditions and strong winds. Additionally, Israel claims that these fires were started intentionally by Palestinian terrorists, and Israeli authorities have made several arrests. Click here to see media coverage of the forest fires from November 24, 2016. “Ethnic Cleansing by All Means: The Real Israeli ‘peace’ Policy.” Mondoweiss. N.p., 18 Oct. 2014. Web. 01 Mar. 2017. Hochberg, Gil Z. Visual Occupations: Violence and Visibility in a Conflict Zone. Durham: Duke U, 2015. Print. “Jewish National Fund.” Jewish National Fund: . N.p., n.d. Web. 01 Mar. 2017. “Palestinian Villages, Israeli Parks: How the Past Echoes in the Present.” Palestine Square | ميدان فلسـطيـن. N.p., 27 Jan. 2017. Web. 01 Mar. 2017. Times, The New York. “Wildfires Spread Across Northern Israel.” The New York Times. The New York Times, 24 Nov. 2016. Web. 01 Mar. 2017. Kids 4 Peace is a global movement founded in 2002 which connects and facilitates long-term relationships between children and families of different religions, including Jewish, Christian, and Muslim, Israeli and Palestinian. They run a six-year program called Pathways to Peace which goes from 6th-12th grade, consisting of meetings, camps and leadership programs that focus on interfaith dialogue and nonviolent action. Kids4Peace is not about looking past the histories and cultures of the other; it is about hearing it and understanding it. It is about honesty and diverse perspectives. It rejects the idea that peace comes from separation, from ignoring the other. Their programs encourage participants to share painful stories, and teach them how to hear these stories without becoming defensive. As one girl in the video said, they meet… become a family, and…forgive the past of [their] religions.”Obviously, the process is much slower and more complex than that, but the roots are evident in such a simplification– conflict resolution comes from love, which can only arise from true understanding of the other. It comes from a willingness and desire to change one’s own views and perspectives, not just defend them. This reflects the principles of reciprocal influence and mutual recognition we have discussed.